Jeff Teague, general manager of VTL Precision Inc. In 2014, Apprenticeship Carolina™, Trident Technical College and five Charleston-area businesses came together to establish the Lowcountry’s first youth apprenticeship program. 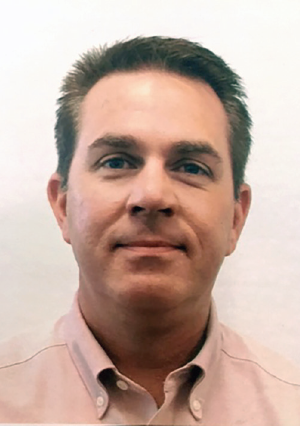 Jeff Teague, general manager of VTL Precision Inc., explains how VTL is already seeing the positive results of being one of the founding companies of the program. EDGE: Please give us some background on VTL Precision. and manufacture of high specification precision components and sub-assemblies for automotive powertrain applications. The core business is focused on precision components for engines, transmissions, turbo-chargers and other powertrain applications for some of the world’s leading automotive brands. VTL established a facility in Charleston in 2007 in direct support of their customer Cummins Turbo Technology. VTL employs approximately 50 full-time associates across multiple job categories. VTL has recently been awarded new business and is planning for expansion in 2017. 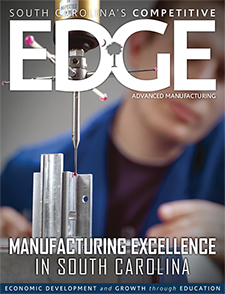 EDGE: Tell us about the implementation of your apprenticeship program. 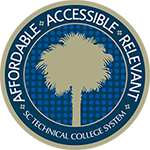 How did Apprenticeship Carolina and your local technical college help you get it started? JT: VTL was involved on the ground floor as one of the first five participating companies responsible for the formation of the youth apprenticeship program in 2014. This effort and the need for the program stems from the industry-wide shortage of skilled manufacturing personnel and the aging manufacturing workforce. The average age of a worker in the industry is late forties. Apprenticeship Carolina was instrumental in getting the program started. They worked to provide a clear pathway from concept to program execution. Apprenticeship Carolina along with Trident Technical College and the five initial manufacturers formed Charleston’s first sector partnership. By sector partnership, I mean a partnership of companies, from the same industry and in their natural labor market region, with education, workforce development, economic development and community organizations that focus on a set of key issues identified as priorities by the target industry. EDGE: What would you say is the top positive outcome of having an apprenticeship program? JT: The best outcome has been making progress toward our initial mission of educating youth on the wonderful, rewarding, and high-paying jobs and career paths available in the manufacturing industry. We also achieved the additional goal of filling the skills gap this year when we hired our inaugural apprentice into a full-time maintenance technician role. While working full time, he will pursue a four-year Mechanical Engineering degree with the continued financial assistance of VTL Precision. EDGE: Is there anything specific that you’d like to highlight about your apprenticeship program? JT: As the smallest company by far of the five inaugural companies in the sector partnership, I would like to encourage other companies to take the leap – size or existing infrastructure is in no way a precursor to having a successful apprenticeship program. The key is to simply get started and let the creativity of your workforce and the apprentices shape your specific program. EDGE: Tell us about your company’s relationship with your local technical college – how are they helping to meet the training needs of your Youth Apprentices? JT: VTL has a long history with Trident Technical College through several of their adult education programs. Most of our employees are graduates from one of their programs. Trident Tech’s broad goal within the program is to provide the apprentices with the foundational knowledge that employers can then build upon and reinforce through application of that knowledge. EDGE: Can you think of a word or phrase that best describes apprenticeship… why? JT: “Win – Win” is the phrase that comes to mind. 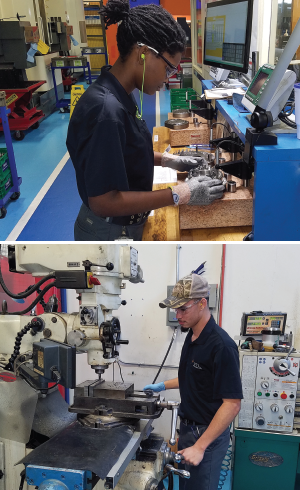 Apprentices graduate high school with a high school diploma, two years of paid work experience, a certificate from the technical college and a Department of Labor recognized national credential. Employers gain the enthusiasm, energy and ideas of a young person. Additionally, employers get actual productivity from the apprentice, and seasoned employees get engaged through the mentoring process. Lastly, employers are creating the foundation for its future workforce. EDGE: What do you like most about your apprenticeship program, and why? JT: The apprenticeship program provides the perfect conduit for young adults to succeed – an opportunity that they may not otherwise have had. EDGE: If you had the opportunity to talk to another company about youth apprenticeship, what would you say? JT: I emphatically recommend the youth apprenticeship program and encourage all employers to jump in with both feet. Don’t overcomplicate the process with misconceptions of what is needed within your company to have a successful program. As long as you can keep your apprentice safe, you are ready. EDGE: Is there anything else you’d like to add about youth apprenticeship and/or Apprenticeship Carolina? Carolina. They seamlessly integrated all the steps of the apprenticeship process into a program, removing any hurdle that may have been in an employer’s path.